Texas' challenge of the Obama-era immigration program on Wednesday focused on what harm the program has done to the state, if DACA violated federal procedures and what took Texas so long to file its lawsuit. But lawyers representing nearly two dozen recipients of the Deferred Action for Childhood Arrivals program countered by saying Texas sat back for six years and did nothing and that its attorneys have yet to prove the harm the state claims it has faced since the program was implemented in 2012. Those were just two of the arguments presented to U.S. District Judge Andrew Hanen on Wednesday after Texas Attorney General Ken Paxton sued the Trump administration in May to end the 2012 program, which protects immigrants brought into the U.S. as children from deportation and allows them to obtain two-year work permits. Hanen’s 2015 ruling, which was upheld by the 5th U.S. Circuit Court of Appeals and the U.S. Supreme Court, was also cited as a reason that the DACA program was a unilateral overreach of executive authority. Texas and six other states sued the Trump administration to end the DACA program after three separate district courts ruled that the initiative must continue. The most recent decision came last week, when a Washington, D.C., judge upheld his order that the administration must continue the program. The reinstatement is set to begin on Aug. 23, absent any further action from appellate courts. MALDEF and New Jersey said Texas could have filed suit in 2012 or amended its 2014 complaint aimed at DAPA to also include DACA, but instead waited six years to take action. They also argued that while DAPA would have benefitted more than 4 million people, DACA has a much smaller pool of potential applicants. Nina Perales, MALDEF’s vice president of litigation, said there are only about 702,000 DACA beneficiaries in the country today. 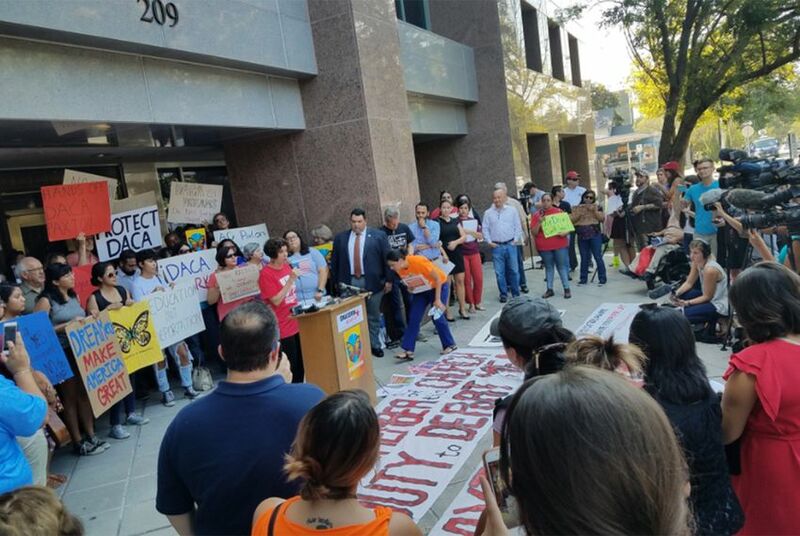 The state of Texas defended its timing by arguing it was waiting for the DAPA outcome to come down and was subsequently encouraged by President Donald Trump’s announcement in September 2017 that DACA was going to be phased out. She made a similar counter argument to Texas’ claim that it has spent vast sums of money providing health care to only DACA recipients.